education institutes, large societies & many more. Designed for Low & Medium Dusty Conditions. Sweeping Capacity of 30000 Sq. Mt/Hr. Factories and Industrial Dusty areas. Plus Size Sweeping Productivity of 217800 SQ.FT/HR. Cleanland (Tirth Hygiene Technology Private Limited) have “Swachh Bharat Abhiyan” by providing cleaning technology solutions & services. Cleanland Ride on sweeping Machine” is suitable for cleaning of roads, ports, industrial area by removing dust, pebble, leaves, loose deposits, coal, dry fertilizer and silica waste, cement waste etc. Just for your ref we have already sold more than many machines in a span of last two years to various Municipal Corporations and Corporate in Gujarat, M.P, Delhi, Maharashtra. One of the best cleaning Ride on Road Sweeper machine like many areas of Bus Stand, Stadium, Railway Station, Museum, Airport, Zoo, Hospital, Public Garden, Streets, Roads, Highways Amusement Park, Colonies, Industries and many more. 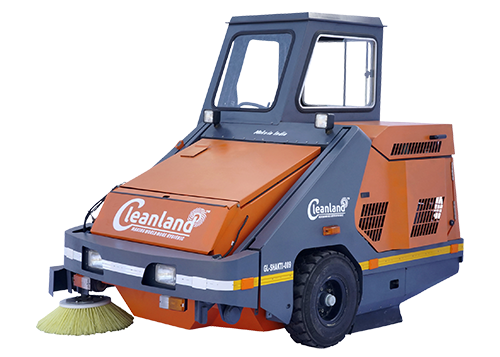 Cleanland Sweeping Machine Available on Rental Basis. Ideal for Cement, Ports, Chemical industries.